The Minecraft: Console Edition update lands just before all versions of Minecraft (minus the PS4) become one single version -- that's the Better Together update, and it's still coming soon. Until then, enjoy 7 features that were previously completely unavailable for console-only players. Nothing too crazy here, but the inclusion of forest mansions should add a new level of challenge to your adventure. New mansions lead to fancy new items and enemies -- the Totem of Undying is especially great. Okay, let's get started. "Dye your bed a different color." Beds are the cornerstone of Minecraft, and they're made with x3 pieces of wood (any type) on the bottom row, and x3 wool in the middle row. Beds can now be dyed, and you can re-dye beds as often you like. All you have to do is hold a dye in your crafting menu with the dye of your choosing. There are 16 colors of dye to choose from, but to unlock this achievement, we're going to select the easiest dye to obtain -- find flowers, either red or yellow, and place them in your crafting menu to get a dye. Combine that dye with a bed, and you'll unlock this simple achievement / trophy. "Lead a caravan of at least 5 Llamas." Llamas are a useful pack animal that can be tamed, but they're rare. Find them in the savanna or extreme hills biomes. To create a caravan, you'll need to tame at least 5 llamas. Like horses, simply attempt to ride the llamas until they're tamed. Don't worry, you don't need to tame all five. After taming one llama, create a Lead. Make a lead with x4 String and x1 Slime Ball. Once you've attached a lead to a tamed llama, any untamed llamas will follow it. You can create a caravan of up to 10 llamas -- or you can attach a second lead to a different llama and make even bigger caravans. "Using the Frost Walker Boots, walk on at least one block on frozen water on a deep ocean." One of the trickier achievements / trophies, you'll have to obtain a Frost Walker book to enchant a pair of boots. This is a treasure enchantment, and can only be obtained from a treasure chest, fishing, or trading with villagers. What makes the Frost Walker Boots so cool are its special new ability -- you can create frost while walking on water, essentially letting you walk across water forever. The tough part is just getting the Frost Walker enchantment. When you do, enchant and just walk toward the nearest deep ocean until this trophy pops. The Evoker is a deadly new enemy that only appears in the Woodland Mansion. These massive, randomly generated structures are very rare. They can only be found in the roofed forest biome -- be prepared to chart out a wide area, because woodland mansions often appears thousands (or tens of thousands) of blocks away from your spawn. 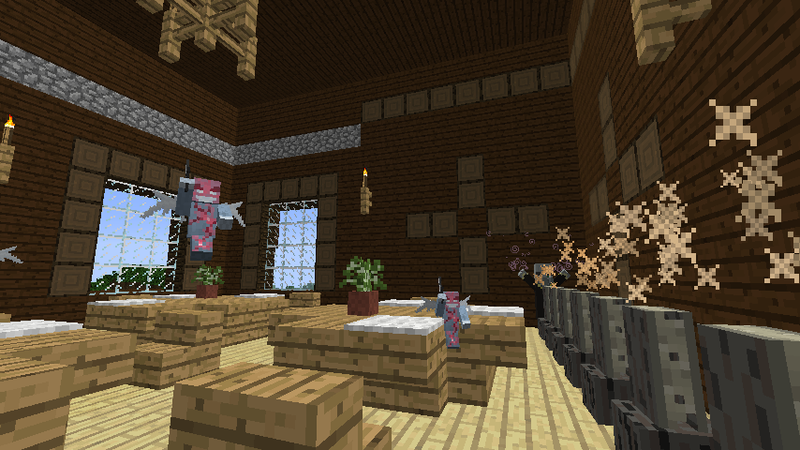 Evokers spawn in specific randomly generated woodland mansion rooms. Each room of a mansion is randomly generated, but Evokers are limited. They will only appear in woodland mansion rooms, and they do no despawn or respawn. The Evoker commonly summons fangs up from the ground, dealing six heart damage regardless of your armor level. "Use the Totem of Undying to cheat death." This is a continuation of the previous achievement / trophy. If you manage to defeat an Evoker, he will always drop a unique item called the Totem of Undying. This powerful item lets you cheat death once. It must be held in the hand / off-hand slot when the player receives fatal damage. When that happens, the totem will break, and the player will reset to 1 health. While on 1 health, you'll also gain a regeneration buff and all status effects will be removed. It's a one-use item, but it can save you from an instant death once. All you have to do is use it, but they are limited. "Name a Shulker Box with an Anvil." Shulker Boxes are special chests that can be picked up, transported or stored in other containers without removed the contents. That means you can dump all your useless junk in a Shulker Box, then put the Shulker Box in a regular chest. To make a Shulker Box, simply combine two Shulker Shells with a basic chest. The problem is finding Shulkers at all. Shulkers are special mobs that are only available in End cities, on the outer islands from the main area of the End. They blend in with other purple blocks, so you'll need to watch blocks closely to see if a Shulker is nearby. If you want to rename a Shulker Box, all you need is an anvil. Anvils can rename a variety of objects at the cost of one level of XP. "Acquire a map from a cartographer villager, then enter the revealed structure." When exploring randomly-generated villages, it's important to check the villagers for important items. In exchange for emeralds, you can (sometimes) find a villager willing to share a treasure map. To unlock maps, you'll need to reach Tier 4 trading with Cartographer villagers. There are two types of maps you can unlock -- Ocean Explorer Map (12-20 Emeralds), or the Woodland Explorer Map (16-28 Emeralds) -- the maps allow you to find an Ocean Monument or a Woodland Mansion, depending on the map you purchase. This is by far the best way to track down the Woodland Mansion, defeat the Evoker, and grab a Totem of Undying. To unlock this achievement, you just need to buy a map and take a trip over to the super rare structure that it spawns.